When we roll out a yoga mat for practice, it’s usually because we seek stability. Stability in the body as we play with balance and gravity, but, perhaps more importantly, stability of the mind. A steady yoga practice is a refuge, a sanctuary, and a grounded force for daily life. In a world that can feel erratic and unstable, yoga offers a reliable source of peace. Utthita Trikonasana (Extended Triangle Pose) is a beautiful manifestation of that safety, represented in a single, solid pose. Yoga is a process of self-discovery which can be intimidating as much as it is freeing. Within that journey, Trikonasana is a grounding force that can be relied upon. There is no better place to explore this power of comfortable stability than in Utthita Trikonasana. Trikonasana is a tonic for modern-day living. Many of us hold tension in the jaw, shoulders and hips, which are all areas that benefit from release in Triangle. It is graceful combination of opening the chest, elongating the spine, stretching the arms and legs, and releasing the neck and jaw. 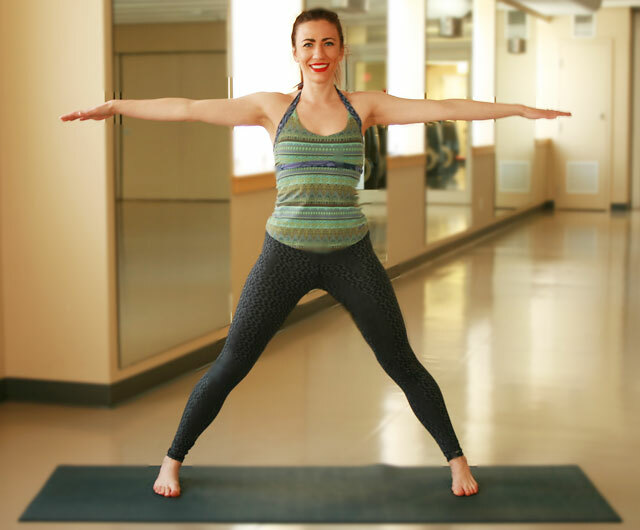 Altogether, this pose targets areas of the body most prone to succumb to everyday trials. Beginners, and those who struggle with balance, may find this pose challenging. To support yourself and gain its immense benefits, a block can be used for the supporting hand. The block can be placed inside or outside the left (front) foot. 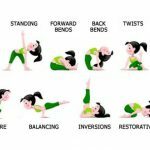 If you find yourself distracted from the pose due to difficulty balancing – and therefore unable to reap its benefits – grab a block and settle in. Begin Trikonasana in a wide-legged stance. Your feet three to four feet apart, depending on how long your stride is. A good distance is one in which your hips have room to stretch, but aren’t tweaked, and there’s absolutely no torsion or tension in your knees. The feet are parallel and pointing forward. Engage the thighs, but keep the knees soft. Now, reach your arms open, parallel to the floor. Shoulder blades are relaxed and the neck is soft (no shoulders hunched around the neck!) and the arms are relaxed, but active. Energy is moving all the way from the shoulders to the fingertips. Point the left toes forward. The left heel is in line with the arch of the right foot. The right foot is at about 30 degrees, but the angle can be increased if there’s tension in the hips – and especially if there’s tension in the left knee. Reach the left arm straight ahead as the right hip slides back. Turn the gaze past your outreached of the left hand fingertips, and keep the neck soft. Ground firmly through the blade of the right foot to keep your thighs engaged and your knees protected. Keep the torso on one plane (as if you were fitting your body between two panes of glass) as you reach the left hand toward the floor or a block. As you move into this stage of Trikonasana, the priority is on keeping length along the side body, both the left and the right. This is a transition stage between standing and the full expression of the pose. Pause and take a full breath in this transition stage to check in with yourself. Are the knees happy? Is there length along the side body? Are the thighs engaged? Pausing here will also cause you to check in with your core. Remember to ensure that your body is in a single plane and you still have length along both sides. Also check in with your balance. If you’re having trouble balancing, find a steady Drishti (gaze) on a nonmoving point on the floor. Now it’s time for the full expression of the pose. Reach your left hand all the way towards the floor. Do not compromise length in the side body just to reach your hand to the floor – no matter how strongly your ego tries to talk you into it. If it means using a block, that’s fine. The hand should be resting lightly, just to support balance, and the shoulders should stay open. Expand through the chest, hips and arms. Reach upward through the right arm, extending the rib case, all while keeping the body on one plane. A wall can be used to ensure that you’re level on a single plane. Slightly curl the tailbone toward the navel. Doing so provides added stability and strength. It will also lengthen the lower back and ensure that the hamstrings can open. Now, breathe space into the pose. Expand your breath into the lungs. Lengthen both sides of your ribs. Keep your neck relaxed as you gaze either at the ceiling or the floor. Relax your jaw, focus your Drishti on the thumb of the right hand, and notice how stable, strong and open your body can be. There is a joy to Trikonasana when you allow expansion in the form (“utthita” means “to extend”). The temptation is to get so distracted by the balancing element that we close up and resist the release. A barometer for your daily practice can be found in the joy you derive from this pose. With enough practice, you’ll surprise yourself with the openness available in Triangle. The hips release, the breath strengthens, and a spontaneous smile may find its way onto your face. A barometer for your daily practice can be found in the joy you derive from this pose. As with any challenging pose, Triangle is an exercise in symmetry. Not only for gauging the balance of the left and right sides, but also for finding equilibrium between the earth and the sky. It can also challenge equilibrium of the mind and internal and external realities. Is your equanimity affected if you lose your balance? How does this pose reflect your relationship with instability – both on and off the mat? Within Triangle is the gift of finding equilibrium. Just as long as you’re open to the unstable process of getting there. Like its namesake triangle, which is known for being the strongest shape in geometry, Trikonasana will hold you, even when you think you may collapse. And, like the triangle, this pose disperses forces within you so that you’ll never implode from the pressure of your practice… or your life.